California has skimped on schools for years. These charts bring it home. Is it true that students in California receive less support for their education than students in other places? How much funding do schools get in California? Is California a rich state? Does California have high taxes? Does California have more children than other states? What does it mean that California expends low "effort" to fund education? Does California spend more on prisons than schools? California consistently skimps on education, and has done so for decades. By how much? Well, buckle up. Measuring it is more complicated than it might seem. "How does California rank in K-12 per-pupil spending nationally...? a) 46th; b) 41st; c) 29th; d) 22nd. The answer is all of them. Depending on how spending is calculated and how up-to-date the data are... the state’s ranking varies widely." Let's start with answers (c) and (d). These are two slightly different versions of a simple-math comparison: divide the number of dollars spent on education by the number of students served. By that simple ratio, California's education funding per student is middle-of-the-pack. About average. Dollars are only good for what they can buy. A simple dollars-per-student ratio is misleading, though. Dollars are only good for what they can buy, and it costs a lot more dollars to run a school in California than it does in, say, Nebraska. Salaries make up most of a school's costs, and salaries in California are higher. They have to be. The labor market responds to supply and demand, and Californians with a college degree have lots of employment options. The rankings that place California at or near the bottom compare purchasing power per student, not simply dollars per student. Dollars don't educate students, teachers do. In order to meaningfully characterize the value of each state's expenditures for education, answers (a) and (b) adjust for the purchasing power of educational dollars in each state. The most thorough analysis of California's educational investment gap can be found at CalBudgetCenter.org, which takes local labor costs into account. For students, parents and community members, this is the comparison that should matter. Dollars don't educate students, teachers do. Why is it important to know that California skimps? Because it turns out that money really does matter. It seems obvious, but for a very long time education outcome data were so low-quality that it was quite difficult to prove a connection between money and learning. The connection was significantly clarified in two studies included in the 2018 Getting Down to Facts II project. 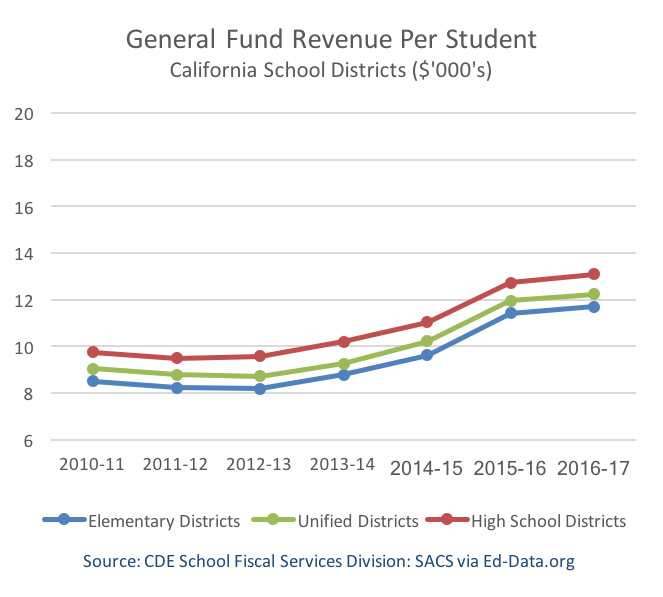 "Money and Freedom", a study of the impact of California's Local Control Funding system, concluded that "money targeted to districts with the greatest student need has led to improvements in student outcomes". In a separate study, researchers were asked to make a responsible estimate of how much money it would take for California's education system to provide all students with the opportunity to succeed in college and career. Following precedents used in other states and findings from expert panels, they concluded that the state would need to increase expenditures by 38%, with variations based on regional costs. This conclusion squares with work by other researchers. For example, "How Money Matters" looks at additional research that comes to the same conclusion: "On average, aggregate per-pupil spending is positively associated with improved student outcomes." What Happened? Why is California so skimpy? Long ago, in the 1960s and early 1970s, California was once a top funder of public education. In a long, slow slide, California has joined Florida and Texas toward the bottom of the national stack. Funding per student in California, adjusted for the most conservative measure of inflation, stands only slightly above where it stood forty years ago. California is no longer even near the top of the stack. A 2016 report, "California’s Challenge: Adequately Funding Education in the 21st Century", estimated that "the amount of additional funding that would be needed to move California to the average funding level of the top 10 states is ... roughly a doubling of current state funding." Education expenditures per student by state, 1970 - 2014, adapted from EdSource States in Motion interactive graphs. Click image to visit. How can this be? Isn't California a rich, high-tax state? Yes, California is a fairly rich state. Based on the 5 years from 2011 to 2015, for example, the state's median household income of about $61,818 exceeded the rest of the USA by about 17%. California's overall tax system is regressive: the lowest-income families pay the highest share of their total income in taxes. And yes, California also collects higher taxes than most states. California's overall state and local tax burden relative to the state economy exceeds the national average by about 11% according to taxfoundation.org. For the 2009-10 fiscal year, California's Legislative Analyst Office (LAO) pegged California's state and local tax burden at $11.30 per $100 of personal income, high enough to put it in the top ten states in the country. (High-income taxpayers might be surprised that the state's overall tax rate exceeds the national average by only 7%. They might also be surprised to learn that the tax system in the state is regressive, meaning that lower income taxpayers carry a higher overall tax burden than wealthier taxpayers.) Want to know even more? California's Legislative Analyst produces a report with a full rundown of California's Tax System. If California has an economic tax base 17% larger than average per household, and levies state and local taxes at a rate 7% higher than average, how can it possibly fund K-12 education so far below average per student? A small part of the answer is that California is a youthful state. It has more students per taxpayer than most states do, so funding for education must be spread among more students in California than in most other states. Texas faces this challenge to an even greater extent than California. By contrast, Florida and Hawaii, famous as retirement destinations, have a relative abundance of taxpayers per student. California has more students per capita than most states, so the resource pie for education is shared among more students than it is in places with fewer young people, like Florida, New York, Massachusetts, Washington D.C., Hawaii and Florida. Texas and Utah must share their education funds among substantially larger numbers of students. An interactive version of this chart is planned to be made available by EdSource. The underlying data can be found here. Age demographics do not explain away California's skimpy education funding, though. For the last four decades, California simply hasn't made education a priority. A state or nation's "effort" to support education is objectively measurable: calculate its funding for education as a percentage of the economy. Historically, California has committed less of its economy toward K-12 education than other states. In other words, the state commits less 'effort' than most states to fund its schools. In 2014-15, public primary and secondary education accounted for about 3.27% of California's economy. Powered by a big boost in the state's education budget, this was a significant increase in "effort" from prior years in California. Nevertheless, California still lagged in its level of commitment to education relative to the rest of the states, where education accounted for 4.04% of the economy. It may sound like a small difference, but 0.77% of California's economy is real money. Does the state's long pattern of low investment mean that Californians place a relatively low value on public education? It might. For example, since 1970 California has increased spending on prisons and incarceration about three times as much as it has increased spending on education. Spending on health care has expanded even more. There are some reasons to believe that the tide might turn in education's favor. For example, according to the Public Policy Institute of California (PPIC), about 2/3 of California adults and voters now say the current level of state funding for their local public schools is not enough. This consensus can drive change. In the years following the Great Recession, Californians passed two ballot measures, Propositions 30 (2012) and 55 (2016), to raise revenue (mainly) through an income tax on California's highest earners. The stock market subsequently rose from its lows to new highs, reviving education funding from its collapse in 2008. Equipped with this revenue, California's lawmakers passed budgets in 2014 and 2015 that revived and then increased funding for education in California. The increase was tremendously important, but it's important to keep it in perspective: California still significantly lags other states in the resources it invests in the education of children. The chart below shows California education dollars per student for elementary school districts, high school districts and unified districts. The top of the chart is set to $20,000 per student for a reason: it's approximately the average amount invested each year in the education of each student in the state of New York. For students, these investment gaps are recurring, and should be thought of as cumulative. We invest in students over the course of a 13-year education. Each year, California invests about $7,500 less per student than the average of the ten states that invest most generously in their public education systems. Over 13 years of skimpy schooling, that's an investment gap of more than $100,000 per student. Long-time observers of California's education system often connect the state's habit of skimpy investment in education with Proposition 13, which flipped the education finance system from stable local funding (through property taxes) to volatile state-sourced funding (through income taxes). An unintended consequence of this structural change is that it weakened voters' political will to tax themselves. In general, voters tend to support taxes that help their immediate community more readily than they support taxes to help others less close to them. By flipping the basic revenue model from local to statewide, California overturned its political underpinnings. School funding in the state has never recovered. Education is the largest function of government. Of course, it's important to acknowledge that most Californians have no idea at all about their state's level of investment in education, either in absolute terms or relative terms. According to an annual survey by the Public Policy Institute of California (PPIC), only 15% of Californians can correctly identify the biggest slice of the state's budget. Nearly half think that the state spends more on prisons than any other function. California funding for K-12 education is skimpy, but it is still the largest function of state and local government. Which of the following represents the largest amount of spending in the state budget? What would be also interesting after reading how much the State of California spends on education is to see how much each county/cities spends on Education and compare that with the costs of living (I've just started this lesson so don't know if it is done in later chapters). San Francisco has a higher costs of living compared to other cities so to see a comparison might be enlightening. Por lo visto, nunca se ha facilitado la ayuda de la comunidad hacia las escuelas, como el voluntariado en diferentes areas que requieren financiamiento o por otro lado se gasta en cosas que no estan completamente preparadas para el correcto empleo. o no ayudan necesariamente a mejorrar la calidad y el progreso de vla educacion. "Recent studies have invariably found a positive, statistically significant relationship between student achievement gains and financial inputs." You can reasonably argue DC or MA are special cases but in a sense every state is a special case. CA gets a lot of less educated immigrants and that might tend to skew outcomes as it takes a while to raise the educational standard of a community. Money does not correlate with outcomes in at least that assessment. Massachusetts is usually at the top of the list and they are famous for the rigor of their statewide tests. Maybe that has more to do with it? If you don't attempt to correlate outcomes by state with money by state then you are just complaining other states get more money. Yet as you point out, CA is a high tax state, so where is the legislature in all this? You can't complain about prop 13 when CA is one of the top 10 states in taxes. The courts ruled (rightly, IMHO) that it was unfair that rich areas spent more on education than poor areas because education was funded by property taxes. Poor kids need at least as much money per pupil. This means it has to be state money. The voters also passed prop 98 to guarantee the legislature spends at least 40% on education. That was to set the minimum and in fact that turns out to be the maximum they will spend. So talk to the legislature. I'm learning that Massachusetts is where you want your child to be educated! I wonder if the California education system is weakened by educating millions of children of unauthorized immigrants or if that is just a myth. I know that some undocumented immigrants do pay taxes. Is the additional tax base that would support these students just not there? Imo, comparing California to other states is often unhelpful because frankly, there IS no other state like California, population and demographic-wise. "It Turns Out Spending More Probably Does Improve Education." This article from the New York Times summarizes a new report that finds that money matters. It looks at the benefits of greater investment in lowest income school districts. "California spent an estimated $2,000 more per K-12 student in 2015-16 than in 2012-13, inflation-adjusted. Largely as a result, the gap in spending per student between California and the rest of the US narrowed from more than $2,600 in 2012-13 to roughly $1,000 in 2015-16. The system seems to be more in place to employ teachers than educate kids. I hope the millennials start taking notice and force the change that is needed to save the public educational system. It's going to take more than just MORE MONEY. Take it easy. If you lower my income, I will not be able to teach here. I can barely afford a condo now. It isn't as simple as you may think. Plus, I pay for a lot of the supplies that I need in the classroom. Do you pay for your supplies at work? The school pays for the bare bones. I pay or make what goes on my walls. I pay for what makes learning fun or interesting. They provide books, some of those are outdated. My criticism of the analysis: it would be even more meaningful to compare California to the rest of the US *excluding California. This state is so large that it influences the average, making California seem more normal than it actually is. There are several resources that compare education spending state by state. A big item in the comparisons is whether they adjust for differences in state costs of living. Hint: California has a high cost of living. A report from the California Budget and Policy Center, "Key Considerations When Comparing California K-12 School Spending to Other States" provides a good overview. Can I ask a true honest question? How do you know if its mis-spending but with good intention and meaning? And how much could it truly be administrators with deeper pockets and at end of day a little left over to stretch between all their schools. Because at what point do people stop reading and accepting budgets that are not true? Going out and asking "is this correct?" Because I did this the last 2 years and it's unbelievable what goes on with school funding. If you don't know enough you don't see it -- but if you do it's unbelievable. I read that we should be no worse then 2012/13, but we received as a school this year title 1 $44,000 and LCFF base $20,000 and supplement $20,000. That's only $84,000 compared to $222,000 in 12/13. And we are 90% EL but the services above and beyond are services we already had nothing new. Where can we get the real truth? How is it that such a large portion of the state's general fund (I believe 40%) is spent on education, and yet the percentage spend per total income is lower than for most states? Also, I think it would be clearer to say, "3.3% of total income" rather than "3.3% of its economy," if that's what you mean. The phrase "its economy" isn't exactly clear to me. Getting education spending statistics right is an endless challenge. In this context, the "right" way to look at it is to include elements beyond the state general fund, such as "local" expenditures and federal expenditures. Regarding the 3.3% statistic, this is education expenditures as a percentage of total personal income, which is usually reckoned to be the right denominator for describing the big, big picture of an economy. I became interested in this approach when debates started about our health care system. When analysts began describing the economic weight of the American health care system over time and relative to other countries, I wondered whether a similar approach could help us understand the big picture of our investment in education. As far as I have been able to determine, this is the most robust way to get the "real" big picture. I used "of its economy" rather than the more technical definition because this seems to make sense to more people. Do Californian's place an unusually low value on public education? No. Polls and voting patterns often suggest that, in fact, public education is one of the few areas that voters are willing to fund. However, this reality creates a significant moral hazard for California public education. Taxes that are portrayed as "funding education" often go elsewhere -- or back fill diversions of base taxes that we all thought were funding education. The majority of counties, for example, do not accurately represent where our property tax dollars actually go. Unless your county shows 10-30% of total property tax dollars diverted to "in-lieu taxes to cities and counties for VLF reduction and Economic Recovery Bonds," it is significantly overstating property taxes to education. And the premise of Proposition 30 (2012) was not to increase education funding, but simply to forestall cuts. California voters are told that the lion's share of property and income taxes go to education ... yet little seems to trickle through. By looking at the States In Motion data from EdSource it seems that 1978 was a critical year in education funding. Before that CA was consistently in the top half of education spending for states. After that CA has steadily declined to our current position as one of the states at the bottom of the funding spectrum. Of course that was the year of Prop 13. But that year also seems to have other important milestones for CA. Of the 40 odd years of data represented on EdSource it's the nadir of students per capita. Maybe that's part of why Prop 13 passed. And according to Pew Research it's also the time when Hispanic student enrollment started to increase rapidly in the United States. From 7% in 1978 to about 24% today. Then came Proposition 1 in 1979 which was upheld by the Supreme Court in 1982 which helped re-segregate schools in CA. And then Prop 187 that passed with broad support in 1994 but was ruled unconstitutional by the federal courts. Perhaps Prop 30 marks an end of an era of continuous decreases in school funding largely based on race and class. Redefining hope and optimism is never easy, but let's hope 2012 is another landmark year for CA.